Hessonite is a member of the grossularite family of garnets. Hessonite comes in colors of orange, yellow orange, brownish orange, reddish orange, and yellow. 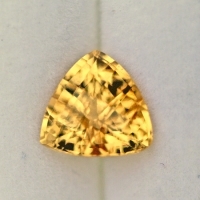 Unique to hessonite is its optical properties which give the gem a shimmering mirage effect this phnomenon only occures in hessonite. Hessonite is believed by many cultures in Africa and other locations around the world to have the power to protect pregnant women and their unborn child through child birth and is sometimes called the birthing stone. Garnet is the designated birthstone for January. Beautiful intense yellow color. excellent cut and polish. VVS, eye clean. Hessonite have unique optical properties that create a mirage or shimmering effect only seen in hessonite. If you like this gem and would like to see more in different sizes and cuts click on the hessonite garnet catagory to see more of these fine gems.